I have been asked in several emails on how to go on with existing ZIV positions, so here is a short note for our subscribers which still hold MYRS/ZIV positions. As you know underlying to ZIV are short positions of the VIX Futures month 4-7. So ZIV moves are about the same as the moves of the medium price of these Futures. 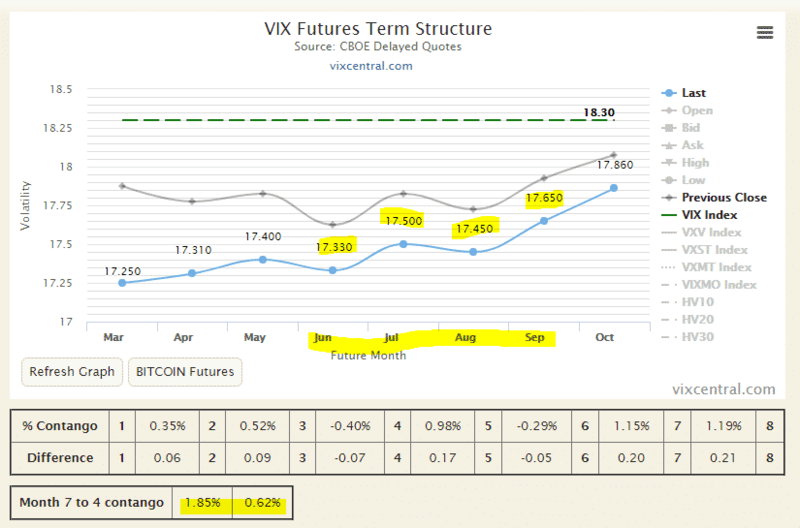 As you can see in the above VIX term-structure chart, the medium price for this Futures is about 19.50$. On February 1st, this medium price was about 14.70$, so its up about 4.80$ which should translate in a 30% drop of ZIV. Today’s price of 19.5$ however is still quite low, and this price can well go to the region of 25$. If the correction continues or markets go sideways with high volatility, then ZIV can further go down quite a lot. This said I would not recommend to invest in ZIV at the moment. We also already said this in our last monthly strategy post. However if you are not afraid and still want to profit from the volatility spike and if you can trade VIX Futures, then the much safer way is to buy VIX calendar spreads. For this you would for example sell the VIX May Future and buy the September VIX Future. The price for such a spread is – 1.30$. This way you only invest in the price difference of the Futures and if these go up to 25$ you will probability not notice much as the September Future will make up the losses of the May Future. This VIX Future spread price of -1.30$ is a very rare occasion. 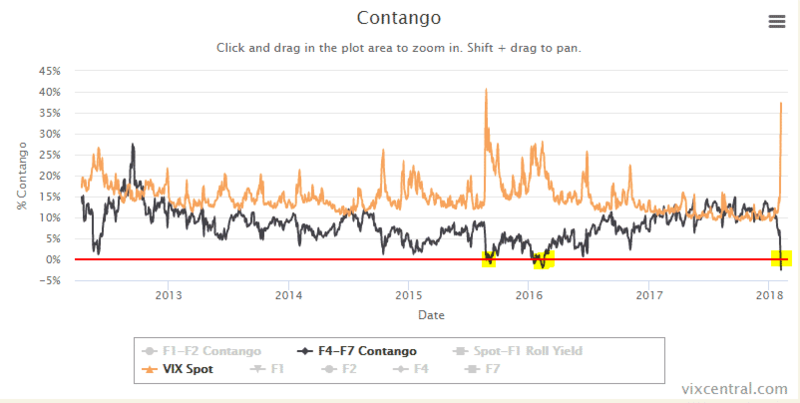 Normally the curve is in contango which means that the further out a VIX future is, the more expensive it is. We only had 3 similar occasions within the last 10 years where the mid-term VIX structure inverted. This was in 2011, 2015 and 2016 and the situation remained like this only only a few days. Going back to February 1. this Future spread had a price of 1.725$ which means that you can make about 3$ if the slope goes again to the normal contango situation. Sure you can also lose something because the slope can become more negative than 1.3$ but the risk of a generally rising volatility is much smaller as for a normal ZIV position. Be aware that trading VIX Futures is only something for experienced investors. Because they expire, you will need to roll these Futures every month. For all other investors, I would recommend to wait until volatility of these mid-term futures which make up ZIV go higher to at least 23 and then you can invest more in ZIV. Thanks Frank. Considering my portfolio contains a 10% investment in MYRS strategy, I assume you would suggest just leaving that alone? Versus selling the ZIV portion of it until things settle down? Yes. Don’t sell into this panic but also don’t double up too early (don’t catch a falling knive). Wait until ZIV seems to bottom and then you can top up what is lost. ZIV will always come back because of the mean reversion of volatility. I notice ZIV is currently under a T1 halt. Has this ever happened in its history? Thank you Frank. Are you aware that trading has stopped on ZIV? For those of us invested in the MYRS strategy, should we continue to hold our positions until the new update on February 16th? Also, if volatility continues, do you see MYRS switching into heavier allocations of UGLD and TMF? ZIV just resumed trading, as of 1:48 around $66. That´s 30% less than 52w High, and 25% higher than the lowest quote yesterday after close. Alexander or Frank, I asked the question in my post above, should we continue to hold onto ZIV in our MYRS strategy until you publish a new allocation on 02/16/18 or should we sell ZIV? It’s a bad time to sell at the lows, better sit out the current losses. VIX reverts to the mean, so futures will come eventually down and ZIV will rise. Only risk is if this inverted term-curve would last several weeks, as then the roll loss into higher futures would start impacting. I can surely understand the frustration looking at my own account! This probably took all by surprise, but here is the thing: As many followers will recall, we were in a similar situation in August 2015 – when some stepped out, and missed the recovery and right part of the chart in 2016 and 2017. Indeed this marks a new max drawdown for MYRS from the top on Jan 8th. But the move is so far well within the historical volatility range of MYRS. 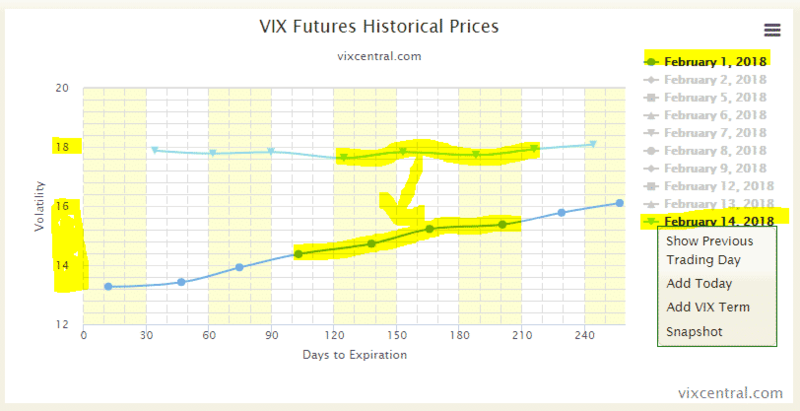 If the VIX term-curve keeps on coming down this might look much better at the rebalancing day end of next week. Stepping out at current lows is not recommended. 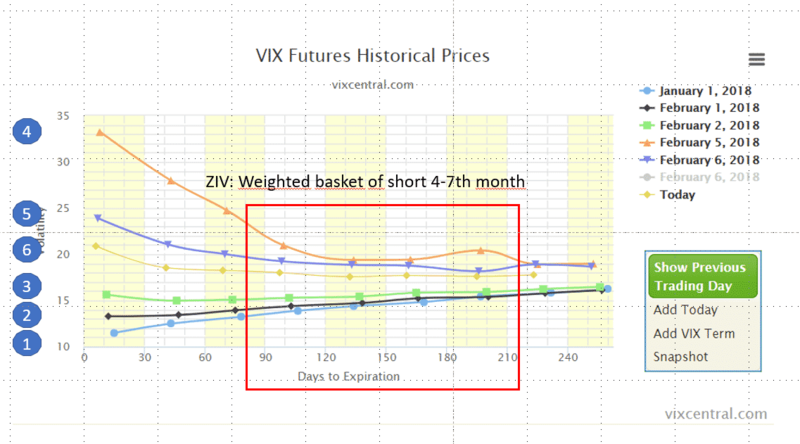 ZIV shorts a weighted basket of months 4-7 VIX Futures, see the red box. What happened is that the futures in this range all moved up, causing the big hit. In addition the curve inverted (front higher than end). As long as the curve stays inverted, the daily rolls of the futures will cause further losses, that´s the risk. As soon as the futures in this range move down (see last two days) we see ZIV recovering. But: We do not expect the curve to recover the historic low absolute level it had in the last months (See Curve Jan 1st), which means some losses will not be recovered from that. Having said that, at the same time we do expect to see in future again a steeper curve, and this will help the risk-premium we collect from the contango. So as the the overall term-curve comes down and recovers contango state do expect some partial relief from the losses – and hopefully nice gradual profits from risk-premia thereafter. held ZIV and was looking to further move some of my defensive positions in as it seems to be recovering, but I noticed that my broker is still not allowing purchases. I know that trading has technically resumed, but do you know if brokers will continue to halt purchase until further notice? You probably need to inquire with your broker if and when trading will be resumed. I’d like to re-read your article “Why we invest in ZIV and not in XIV” (linked of your Whitepapers page) in the light of the last few days, but I’m sorry to find it’s now behind a Seeking Alpha paywall. Agreed. Thank you. Very good article that keeps the hard to understand details to a minimum. XIV ETF Closure! The following article explains why. Also note that when the underlying measure for an inverse fund doubles in a day, the fund implodes. Could this happen to ZIV? As a small Valentin´s Day gift, the term curve went into contango state as of yesterday close. Should this remain, then at least ZIV will stop bleeding from daily roll losses. It also remains to be seen if and how much VIX spot and the term curve will further normalize and how much it will re-assemble the low vola state before Feb 5/6 crash. Or if the time of VIX spot around 10 is over and we get into the former long term average range of 15-18 – as many analysts say. A further recovery of the YTD -22% of ZIV depends on this. Just input your assumption of future VIX term curve in the green cells to get a very rough idea where ZIV price might be. Very rough as this ignores daily rolls, roll losses and further math. But hope it gives you an idea just based on F4-F7 prices. The sheet is protected, but you can make a copy in your own google drive (“save a copy”). I would be interested to understand better how MYRS sits in relation to their analysis. GIven that Frank has recommended not using the MYRS during the current environment, I was wondering how I could tell when the conditions were right to use it again? +3%> contango between F1 and F2 months? VIX below 17? Just trying to figure out when you guys think it would be safe to use the strategy again, understanding that I’m only asking your opinion for educational purposes. Looking for something quantifiable. Best is to regularly check the web site vixcentral.com. 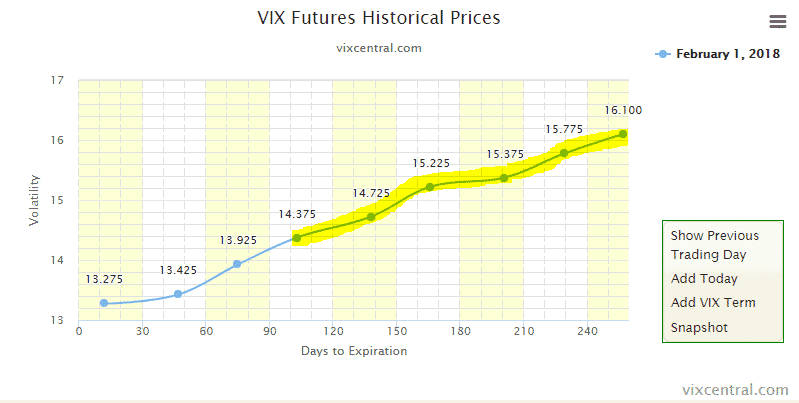 Here you see the VIX Futures term curve. ZIV is composed by the futures 4-7 and below the chart you see the current roll yield which is now 0.99% per month. This means that the curve is quite flat. Normally the yield is near 3% per month. Up to January the medium level of these 4 VIX Futures was very low at about 14% now i is about 17.5% but in March 2016 it was above 20%. So a move from 17.5 to 20 would mean a drop of ZIV of another -15%. If there is a bigger correction, then this level can well go to 25 or even higher. This would be a 40% drop of ZIV. However then you definitely have to invest again into ZIV or better short VXZ as you can be sure that this level will come back to about 15 when volatility normalizes again. I probably would wait for another volatility spike before to invest again, and then I would short VXZ instead of buying ZIV to avoid the rebalancing losses such inverse ETFs have in more volatile markets. If you do not exaggerate, you do not need to worry to much about intermediate losses, as with volatility you can be sure that it will revert to the mean sooner or later. Wouldn’t SVXY be a better choice , since ZIV is an ETN which XIV also was before it imploded ? SVXY is an ETF investing in the two front VIX Futures. They reduced now artificialy the risk by deleveraging the new SVXY by a factor 2. ZIV is investing in the less risky midterm VIX month 4-7 Futures. ZIV would also be terminated if these Futures would more than double in price. In February however we have been very far away from such a spike. But anyway if ever you can, then it is always better to short VXZ which is the same as buying ZIV. Biggest advantage of shorting ZIV is that you don’t have rebalancing losses which can sum up to quite important amounts over time and you also eliminate the termination risk.